I could not stand it any longer hanging around the house so yesterday afternoon around 1:30 I hooked the boat up and headed for the lake. I put out at a private ramp downlake and rode around just seeing what I could see. I started off heading to the dam and 3rd dike area where I found the warmest water naturally, 48*. I went up to the 2nd dike and the water temp dropped to 44*. The pockets on the north side were the same. I went on up to Dukes [42*] then up to the mouth of Sturgeon where it was 39* with the backs of all the pockets frozen. No need to go up any further, too cold for me. All the upper lake is still froze. Hopefully some warmer weather will bless us soon so we can get back in action. I popped a couple of screen shots yesterday, they are as sad as the weather is. I couldn't find anything worth stopping on in the few hours I was out. It was so disappointing I got off the water around 4. The upper shot was taken down by the dam. Although I did not fish these I am assuming the school of fish on the left are punk Stripers hanging around a ball of small baits. 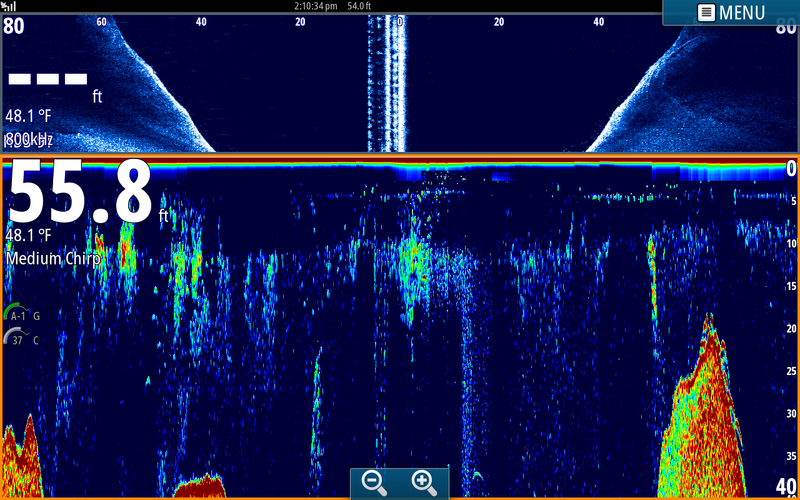 The vertical stack of fish on the right may have been white perch. In the bottom picture I was checking humps out downlake and found Bass hugging the hump in 20 to 30 feet of water. You can see them on the right hump. You can click on the picture to enlarge it if you want. Again, pretty boring but I had to get out. Looks like the rest of the week will be a replay of the last 8 weeks. Unstable. Hi Jim, thanks for the update on the lake. Question: What's going on in the bottom pic starting at about 10ft and cascading down? Thanks again. Basically it is noise. 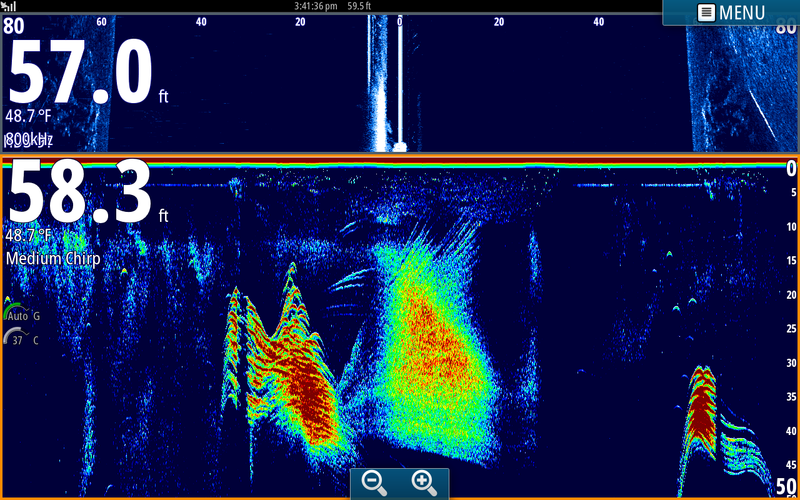 The yellow with red highlights are small groups of bait but the rest is noise. I do not use any filters, just TVG. The Time Varied Gain (TVG) functionality compensates for propagation attenuation of the sound waves reflected from a target in the water. Basically it will equalize echo presentation throughout the water column so that targets of the same size appear in the same density independent of range or depth. Using TVG I loose the surface clutter but gain in all echos below that. I will cut back on TVG when fishing super shallow and this time of year I increase it. I don't notice noise anymore when looking at my unit, I am concentrating on objects and color. Great, that's very helpful. I'm considering getting one of the new Gen3s but want to do my homework first. I need to make a trip to Greentop too. Thanks for your time.